Ukrainian orbital launch vehicle. Updated version of Tsyklon 3, announced by the Ukraine in 2005 as being in design. Improved lower stages, new upper stage and a new 4.0-m diameter payload fairing. No production plans. 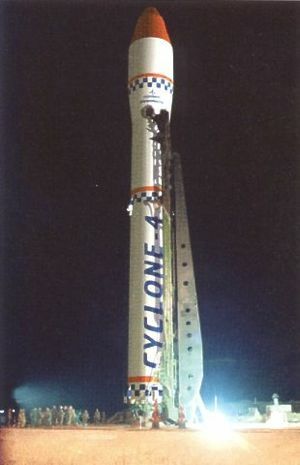 AKA: Cyclone 4;F-3. Status: Design 2005. Payload: 4,900 kg (10,800 lb). Gross mass: 198,250 kg (437,060 lb). Height: 39.95 m (131.06 ft). Diameter: 3.00 m (9.80 ft). Apogee: 400 km (240 mi). capability to provide thermal safing of the interstage fairing space by applying high-pressure air in the event of an aborted launch. The rocket system was in the design phase in 2005. The National Space Agency of the Ukraine said in production it would be capable of more than 6 launches per year. The vehicle could place a payload of 5250 kg into low earth orbit (185 km / 51.5 deg). Vacuum thrust of stages 1, 2, and 3 were 303, 101.5, and 7.8 metric tons respectively. All stages used N2O4/UDMH propellants, with the stage specific impulses being 300.4, 314, and 325. Maximum G-load was 6.8 G's, and injection accuracy into a 500 km circular orbit was within 5 km of altitude and 0.05 degrees of inclination. LEO Payload: 4,900 kg (10,800 lb) to a 400 km orbit at 51.60 degrees. Payload: 500 kg (1,100 lb) to a GEO. Family: orbital launch vehicle. Country: Ukraine. Agency: Yuzhnoye.